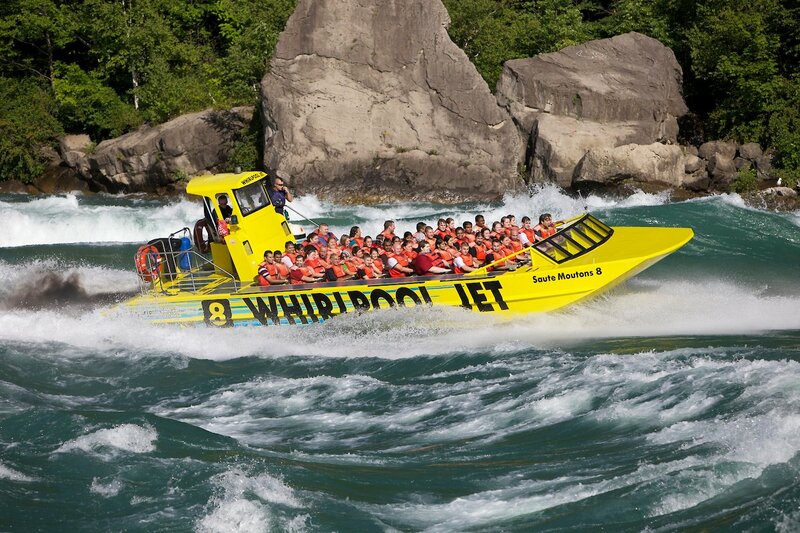 The Whirlpool Jet Boat has two locations in Niagara Ontario Canada, and one location in the United States. 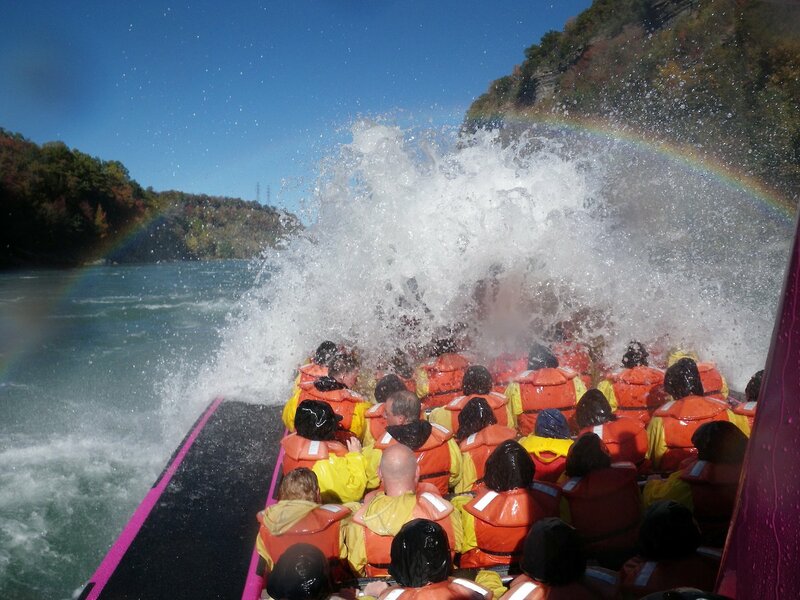 The Niagara Whirlpool Jet Boats ride is a must do when visiting Niagara. If you are looking for a wild ride this is it! Of course the combatants of the War of 1812 didn't travel the mighty Niagara River on Whirlpool Jet Boats, but in this day and age you can retrace their historical journey as part of a Whirlpool Jet Boat Tour (WJBT). The jet boat tour is more than just the historical nuances of the Niagara area. It’s a once in a life time opportunity to comfortably experience what is commonly referred to as the “Mount Everest” of white water. As you speed along the Lower Niagara River at 80 km/h in the confines of this truly one of a kind jet boat, the river guide will tell you all about the fascinating history of the Niagara area, local points of interest as well as the mechanics of the impressive vessel you are touring in. Highlights of your round trip will include the power plants of the Niagara Gorge, the 175ft. stone wall canyon, and the Whirlpool Cable Car. You¹ll be astounded as the 31,000 lbs. of thrust from the jet boat vanquishes the mighty Class 5 whitewater of the Devil¹s Hole Rapids and the swirling waters of the Whirlpool. Rest assured, you’re in professional hands as all captains and Whirlpool Jet Boats are certified by both the United States Coast Guard and Transport Canada. 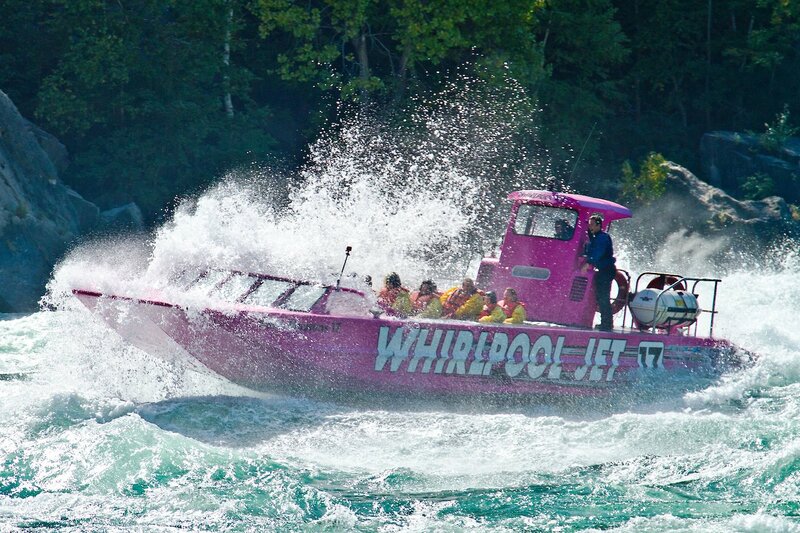 Whirlpool Jet Boat Tours departs daily in season from the Water Street Landing in Lewiston, NY, the Floral Clock in Niagara Falls, ON as well as the King George III Inn in Niagara on the Lake, ON where WJBT was originally established in 1992. Passengers can choose between either a “Wet Jet” or “Jet Dome” experience. WJBT’s one of a kind white water tour will hydrate your senses as you take on Class 5 white water that’s guaranteed to leave you absolutely soaking wet and amazingly refreshed. If getting wet is not for you, the Jet Dome tour follows the exact route as the Wet Jet but shelters you from the water. Passengers are ultimately encouraged to bring their cameras for the journey as they are presented with unparalleled photo opportunities while in the Gorge. For a unique and exciting Niagara adventure, Whirlpool Jet Boat Tours is a perfect fit. 3 WHIRLPOOL JET BOAT LOCATIONS - Canadian departures from 55 River Frontage Road, Queenston/Niagara on the Lake, ON (optional check-in at Floral Clock, 14004 Niagara Parkway) and 61 Melville Street, Niagara on the Lake, ON. US departures from 115 South Water Street, Lewiston, NY.